World leading sea level expert Prof. em. Nils Axel Mörner presents some stark examples that show how the IPCC and climate activists are wildly exaggerating their claims of rapid sea level rise. Mörner studied the Kattegat Sea between Denmark and Sweden. In this region sea level has not increased as announced by climate alarmists, but instead decreased. The actual oceanic increase in the past 125 years can be estimated as modest at 0.9 mm per year. Stockholm’s tide record is the second longest in Europe; the mean long-term change in sea level is a decline of 3.8 mm per year. The country itself is rising 4.9 mm per year due to the post-glacial rise of the continental landmass. The difference of 1.1 mm per year is the true oceanic component. In addition to European locations, Mörner also looks at the Indian Ocean and the Pacific. He has just returned from the Ouvéa area off Nova Scotia. In the 17th century, the sea level was 70 cm higher, as confirmed by immutable geomorphological facts. At that time, the “Little Ice Age” with larger glaciers prevailed in the Alps (as Professor Patzelt showed). How could more liquid water be present at the equatorial area at the same time? Video of the lecture (in English!) by Prof. em. Axel Mörner at the 12th IKEK in Munich. The phenomenon thus proves that the IPCC is wrong. In warm times, the sea level does not rise globally. The reason for this is the so-called rotational eustasy of the planet: In the north, the volume of water increases a bit, at the equator it remains about the same. Also other islands or coastal regions show a sea level change, such as the island Ouvéa, also the Fiji Islands, the Maldives and Goa in India. Here, too, the oceans sank around 1700, rose around 1800 and sank again after 1950. Global sea level changes followed the moon’s tidal super cycles, which in turn stem from the large solar cycles. The sun also affects the Gulf Stream in the North Atlantic, which brings warmth to Western and Northern Europe. At maximum solar activity, the Gulf Stream flows northeast and sea level rises. During a solar minimum, the Gulf Stream flows from east to southeast and sea level drops to the north. 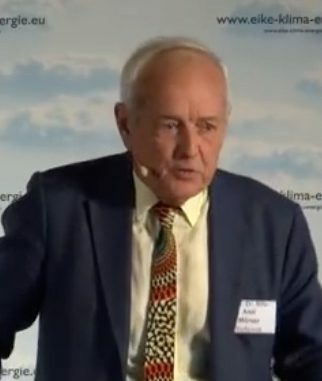 Mörner emphasized that the solar cycles and gravity of our neighboring planets, the solar wind and the moon, determined our climate and our environment. The carbon dioxide greenhouse effect has no place. Mörner recommends observing physical laws and the evidence from nature for the procedure of determining sea level.